Hockey is India’s national sport. The Indian men’s field hockey team won 8 gold, 1 silver and two bronze medals in Olympics games making it a very successful hockey team. Despite being the national sport, hockey has always struggled against cricket in terms of popularity among the Indian sports fans. The Indian men’s hockey team was first non-European member of International Hockey Federation. The Board of Control for Cricket in India (BCCI) as the name suggests, controls Indian cricket. It is a full member of ICC – International Cricket Council. Undoubtedly, cricket is the most popular sport in India and players have large fan followings. It is usually said that cricket is not just another game in India it’s a religion. Cricket was brought to India by British in 1700’s. The first international team arrived in India towards the end of the 19th century. First class cricket was played for the Ranji Trophy which began in 1935 and continues to today. After national independence, Indian cricket saw marked progress of the sport which culminated in the victory of Indian team in the 1983 World Cup under the captainship of Kapil Dev. Hockey was also played in British regiments in India and gained a good deal of popularity. The first Hockey club was formed in Calcutta in 1885 and Bombay and Punjab joined later. The Indian hockey team made its debut in 1928 in the Amsterdam games and never looked back, winning 8 gold medals in the Olympics games. Indian cricket team participates in a number of international tournaments and a number of domestic tournaments assist in improving cricket standards in India. The World Cup, ICC Champions Trophy, Commonwealth Games, Asia Cup and Australia Cup are the major international tournaments. Ranji Trophy and Irani Trophy are the domestic cricket tournaments conducted by BCCI. 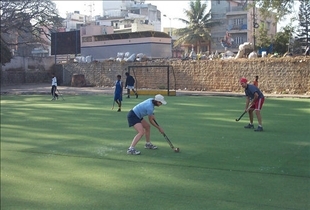 As far as hockey is concerned a number of domestic tournaments in various states are conducted. Premier Hockey League has also been popularized since 2005 in efforts to make Hockey more popular in India. Most popular sport in India. BCCI, the governing body, is one of the richest sport organizations. British played cricket in India in 1700’s. First class cricket was played in Ranji Trophy which started in 1935. Indian cricket team won 1983 World Cup under the captainship of Kapil Dev. World Cup, ICC Champions Trophy, Commonwealth Games, Asia Cup and Australia Cup are the major international tournaments where team participates. Hockey is India’s national sport. Indian men’s hockey team has won 8 gold, 1 silver and two bronze medals in Olympics. First Hockey club was made in Calcutta in 1885. Indian hockey team made debut in 1928 in Amsterdam games. Indian Olympic Association (IOA) and Hockey India are the bodies governing hockey in India. Premier Hockey League is conducted since 2005 to make Hockey more popular in India. Which sport deserves to be India's national sport? So should encourage to play Hockey also. hockey is one of the fastest sport in the world. there are 127 countries playing hockey whereas there are only 17 countries play cricket and if the world of cricket is so small it is not so difficult to win worldcup. “Unity is strength” sits perfectly in case of Hockey. Frankly, hockey is uninteresting to me. There are too many interruptions from the referee, the flow is broken. It is a fact that is not popular with Indian audiences. Cricket, on the other hand is like religion. Cricket, also, has variations like one-day, test, 20-20, which makes it popular with a wide variety of audiences like the youth and the grown-ups. I think it is the fault of the administrators, more than any others, which has resulted in hockey not gaining in popularity despite having great players can be world beaters. Once our hockey team starts winning world championships, i think maybe, the popularity of the game would increase. The surge of interest in tennis, badminton, chess have been because of stalwarts like leander, mahesh, sania(s), vishy among others.